Now that we have progressed to the point where the first 20 locomotives have been ordered I’d like to address a few interesting things having to do with the design and construction of these engines. One thing you may not realize, and which will form another of the “twenty five things you may not know about Big Boy” is the fact that steam locomotives were rarely made entirely by the locomotive builders, and certainly none in the modern steam era. In the case of the Big Boys more than 70 makers of locomotive devices and appliances were involved in supplying elements to create the finished product. The list of these companies formed a virtual who’s-who of the locomotive supply industry. 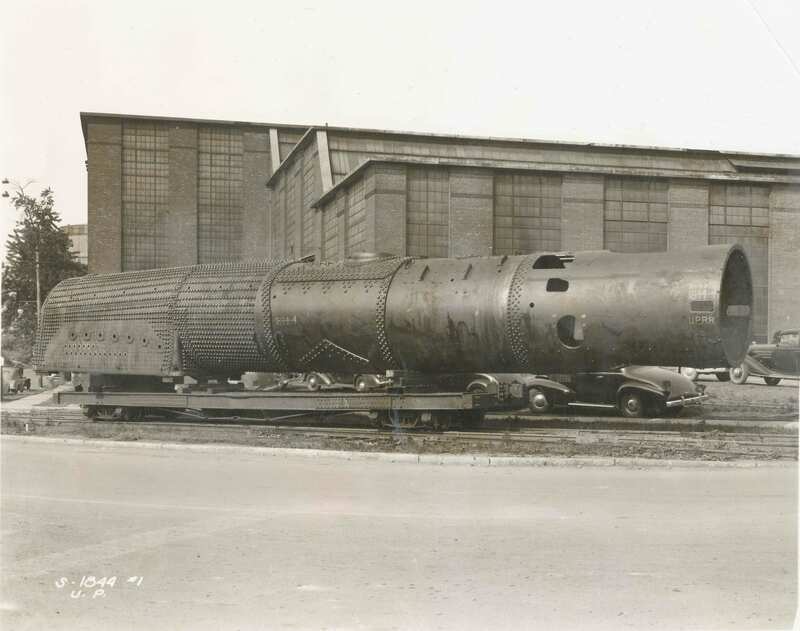 To cite but a few, boiler and firebox steel plate was provided by the Bethlehem Steel Co. General Steel Castings Corp. poured the massive engine and tender frames, pilot and other castings. Roller bearings for driving and truck axles were provided by both SKF Industries and Timken Roller Bearing Co. Nathan Manufacturing Co. sourced lubricators, fusible plugs (a safety device placed in the crown or top sheet in the firebox, intended to melt and allow water/steam to be forced into the firebox and quench the fire in the event of a low-water condition and avoid a catastrophic boiler explosion), water gauges and other equipment. The International Nickel Co. provided the steel used in side and main rods, driving axles, crank pins, and valve gear parts while the steel used to make the crossheads was the work of the Vanadium Corporation of America. The needle-roller bearings used in the valve gear were made by The Pilliod Co. (which also owned the rights to and made the Baker valve gear popular on many roads). The Locomotive Finished Materials Co. produced pistons, the Standard Stoker Co. provided the Type MB stokers, the Pyle-National Co. produced the headlights and turbo-generators while the Adams & Westlake Co. made the classification lamps. Ashton Valve Co. was sourced for the various gauges used in the cabs. The list went on and on. In order that they could produce the desired work the Big Boys were required to be just about as large as they could be and still operate over the railroad without forcing major changes. That said, it was still found that curves would require re-alignment in certain areas and the existing turntables at Ogden, Green River, Laramie, and Cheyenne would require replacement in addition to extending roundhouse stalls. They would also be restricted in sidings, yard trackage and other areas, usually due to weight or clearance considerations. In an effort intended to constrain the length of the locomotive it was determined that the rearmost two pairs of driving axles of the second engine would need to be placed beneath the firebox. This fact meant that the designers could not make use of the more desired and time-honored sloping grate arrangement seen on most locomotives. The mechanical engineers were forced to utilize a flat grate design which produced a less efficient draft than a sloping grate. This arrangement was most certainly not new to Union Pacific, having been earlier used in similar fashion with both the 4-12-2 and 4-6-6-4 classes. To offset this problem a “combustion chamber” (again certainly nothing new, having been used in all classes of power built by Union Pacific for more than two decades) was applied between the front of the firebox and the rear boiler tube sheet, of extraordinary length. At 112 inches it was exceeded in size by few other locomotive designs. The combustion chamber allowed for more complete burning of fuel prior to the entry of hot gasses into the boiler tubes, which would further transfer heat to the water surrounding the tubes and flues. In virtually every sense the Big Boy boiler was extraordinary. The accompanying photo of the boiler will provide an idea of the size. Keeping in mind the fact that it was designed to be as small as possible while still producing the power needed to perform the intended work, imagine that the boiler was more than 62 feet long. This fact, coupled with the length of the crown sheet (forming the top of the firebox) at approximately 27 feet, forced the application of not the usual single water “sight” glass, one on each side of the boiler in the cab for engineer and fireman, but two glasses for a total of four, in order to maintain proper vigilance of water level on the intended 1.14% maximum gradient. At the front of the smokebox the outside diameter was 90 inches, and this had been reduced as much as possible to allow for the required size and necessary movement of the steam pipes beneath it. The first of the three barrel courses forming the actual boiler behind the smokebox was 1 & 11/32 inches thick, and that of the second and third courses was 1 & 3/8 inches thick. The third boiler course ahead of the firebox was 106 9/16 inches in diameter. Calculations made by both Union Pacific and Alco engineers had developed that a boiler which would fit within the clearance limitations yet provide the power necessary could be built if a working pressure of 300 pounds per square inch was utilized. Anything less would require a larger boiler, because higher pressures are more efficient. It may surprise you to know that at 300 pounds per square inch pressure water inside the boiler doesn’t actually boil until it reaches approximately 417 degrees. The efficiency of steam increases with temperature. The addition of the Elesco superheater caused steam temperatures to rise to 750 degrees and more, further improving efficiency. In print advertising, Alco stated that the boiler was designed to be capable of 7,000 horsepower! It would be very easy to go on and on about the boiler and related elements, but I am hoping some of this information is found interesting and which readers may not have previously known about these massive locomotives. When I think about these boilers and the completed locomotive I marvel at the concept of a locomotive approaching three-quarters of a million pounds rolling down the rails, and doing so with amazing smoothness and grace. We know about the monstrous boiler, but it was the frames and running gear which allowed Big Boy to move and put all that power to the rail. Just above I made mention of the “smoothness and grace” with which the 4-8-8-4s made their way across the railroad. A contributing factor is found in the use of Alco’s “Lateral Driving Box Cushioning Device.” It had long been known that making provision for side-to-side or lateral movement of axle bearing boxes made the transition through curves much easier on locomotive frames and running gear, however doing so without some means of controlling this lateral motion was very soon found to bring a decided negative effect, “nosing” through curves and even on straight sections of trackage. One only need think about the massive forces at work as the wheel flanges of an engine banged over against railheads to imagine the astronomical loads imposed on wheels, axles, bearings, frames, etc. Allowing this to happen over days, weeks and months proved extremely expensive in terms of locomotive maintenance and greatly limited speeds. Well prior to 1920 locomotive builders and the related supply industry had been working on designing controlling mechanisms which could allow mechanical engineers to provide for lateral motion, but do so without the damage otherwise incurred. Union Pacific had already begun use of such a device, as seen in the 1917 purchase of the system’s initial order of 2-10-2 locomotives. By the time Big Boy was on the design board these mechanisms had come a long way. Far and away these devices were most usually found on the leading driving axle, however Alco and Union Pacific took the application of these assemblies to a new height with their use on the first three driving axles of both front and rear engines. Together, these devices worked with the very carefully designed spring suspension system and brought about a superbly free-rolling and smooth locomotive. You may have noticed in my brief description of some of the suppliers contributing myriad components utilized in the construction of these locomotives that I cited the needle roller bearings used in conjunction with the valve gear. All of the various pins were fitted with these bearing assemblies, known as “McGill Multirol “even though owned by The Pilliod Co. Union Pacific had earlier used these bearings in the 4-8-4’s built in 1939. In addition, again as used on the 1939 order of 4-8-4’s, the eccentric crank bearings were designed to make use of SKF’s self-centering roller bearings. Together with the needle bearings in the valve gear, this application provided for materially increased mileage between visits to the shop and much improved retention of the dimensions which were required to ensure proper timing of the piston valves, and had a significant positive effect on both performance and economy. Thinking further about the rods and valve gear, I have always been amazed by the piston rods used on the front engines of these locomotives: nearly nine feet in length! More, these rods were bored hollow for added strength and resistance to torsional twisting and bending. When considering the incredible forces being directed to the piston faces as the throttle was opened, applied directly through the piston rod to the crossheads and main rod wrist pins which were then expected to not only move a locomotive weighing well more than one million pounds but actually start a train, it seems amazing that the piston rods wouldn’t immediately bend. Considering this brings into crystal clarity the job accomplished by the crosshead guide bars which were designed to support the crosshead in several bearing surfaces within a single guide, sometimes knows as the “multiple ledge” design. I hope that touching on a few of the special elements of the design and construction of these great engines has been found interesting, and that you now have received a few more of the “25 things you may not have known” about the Big Boys. More to follow with the next entry. Thanks for reading!